Even as vehicles become more fuel-efficient, the unending market shift toward crossover utilities, SUVs, and trucks kept the overall average U.S. new fleet efficiency stagnant for the fourth year in a row. For 2017, sales-weighted new-car fuel economy landed at 25.2 mpg, an improvement over 2016 of just 0.1 mpg. The last time there was any appreciable increase in sales-weighted fuel economy was in 2014, when it went from 24.4 to 25.1 mpg. 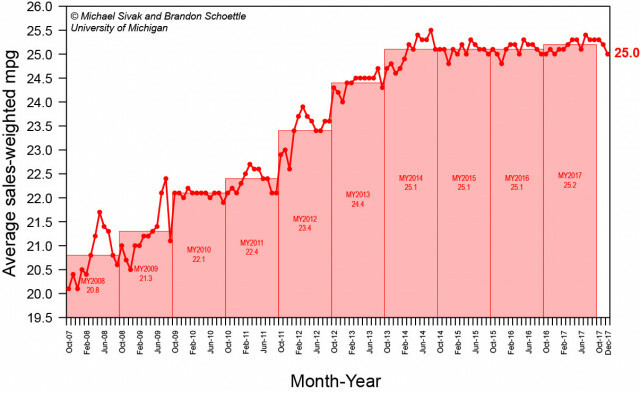 The data comes from the University of Michigan Transportation Research Institute (UMTRI), which has tracked sales-weighted fuel economy since 2007. In addition to an annual average, UMTRI tracks a monthly average. December saw its average decrease by 0.2 mpg. 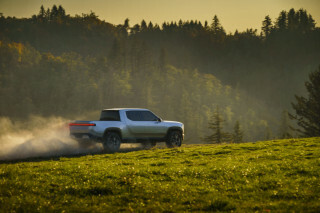 "This drop likely reflects the increased proportion of light trucks versus passenger cars in the sales mix," said Michael Sivak, Director of Sustainable Worldwide Transportation. Average sales-weighted fuel economy has risen almost 5 mpg since UMTRI began tracking fuel economy in October 2007, but virtually all of that increase occurred between 2008 and 2014. 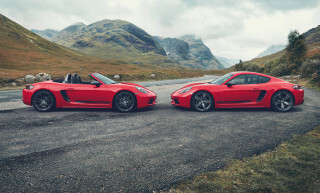 As the United States economy improved, consumers gravitated toward larger, thirstier vehicles. And unlike the market shift toward SUVs in the '90s, analysts expect this to be a permanent change. So permanent, in fact, Ford has decided not to bring the new Fiesta subcompact to North America and it canceled or postponed a forthcoming redesign for its Fusion midsize sedan, previously planned for 2020. 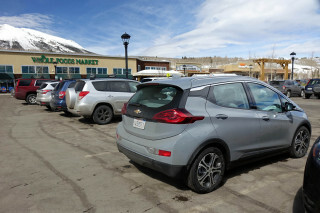 The big question for fleet fuel economy then becomes: At what point will growing sales of plug-in electric cars start to have a noticeable impact? While such sales have grown steadily for seven years, except for one slight dip in 2015, cars with plugs still represent only about 1 percent of U.S. new-vehicle sales of 17. 5 million last year. Sales of hybrid-electric vehicles without plugs, however, have fallen substantially since their 2014 highs. Toyota sold a total of just 99,180 Prius hybrids across its four-car lineup, for instance, compared to a 2012 peak of 237,000—though it added 50,000 less-efficient RAV4 Hybrid crossover utilities to its mix.